Enuresis Hypnosis may help someone who has reached adulthood, but may stay be prone to a lack of bladder control during the night.Enuresis, or bed wetting, can bring with it all sorts of life restrictions that we introduce in order to prevent our embarrassment, particularly when staying away from home. Often enuresis or nocturnal bed-wetting is not a physical issue. The mind can play a part in the bladders proper control. 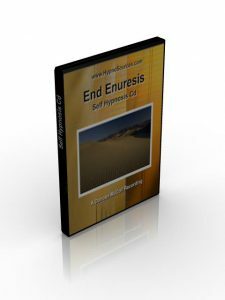 This “End Enuresis” hypnosis recording also helps daytime enuresis as well as during sleep.